We finally had to leave Colorado. Dang, but that was hard! Hwy 24 to Woodland Park was still closed and Don still didn’t want to drive around Denver, so we made this circuitous drive down to Cañon City and then north through Buena Vista and Leadville to I-70. It was really a pretty drive and not a lot of traffic, but it took a lot of time. 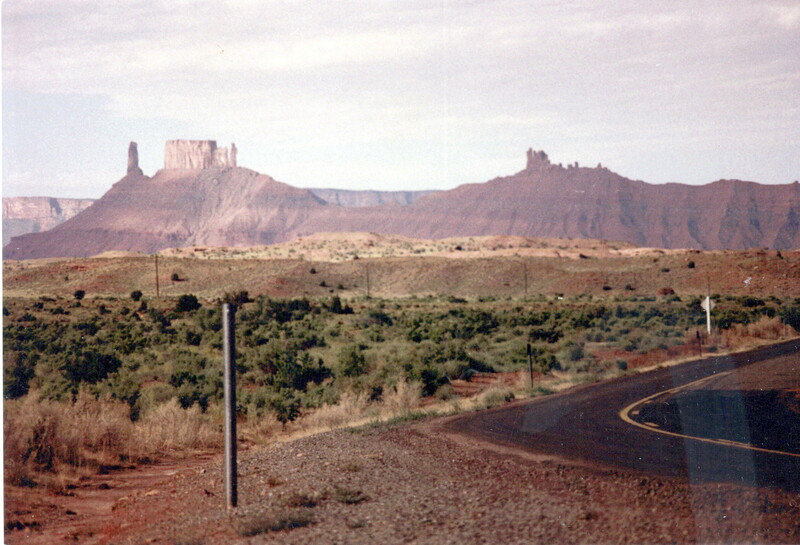 Our goal was to make it into Utah to camp along the Colorado River one more time, for “old time’s sake”. Don’s older brother was living in Rifle, CO, and we’d driven down to spend a week with him. On our return trip to Oregon, we cut across Utah along Hwy 50 to Ely, NV, to see my folks. It was early in the morning when we reached the sign to U-128, marked a “scenic byway” on our map. 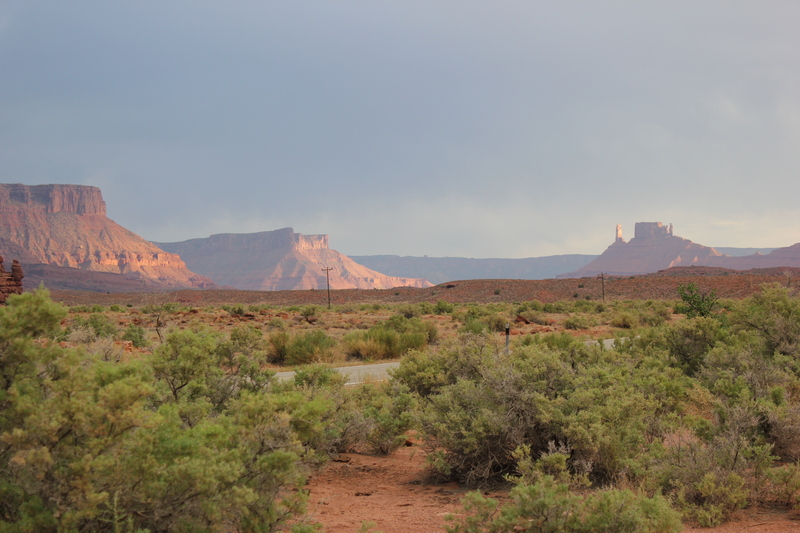 We weren’t certain it was paved, but we decided that since it would take us down close to Moab and by Arches National Park, it was worth the risk. Oh, to be young and stupid again! Nowadays, I’d say “be sure of your road first” (but I know I’d be lying: we haul extra water, tires (plural now, thanks to Les Schwab in Burley, ID), food and gear). There was a very cool suspension bridge (the historic Dewey Bridge, destroyed by a brush fire in 2008 – you can read the blurb here.) We didn’t take a photo of the bridge. The road was paved all the way through and we met a total of three other vehicles (possibly three, no more). It was scenic, secluded, beautiful – truly a hidden gem. First, the rocks haven’t changed much. Second, the number of people has increased in a mind-boggling manner. Third, nevermind my rants about some of the “visual aids” offered by the Moab tourist industry (or whomever it is that straps airplane landing gear to their rig and drives slowly up the first five miles of the canyon from Moab, lighting up the same rocks you were staring at under the searing hot sun). Apparently the latter is a free “attraction” designed to “enhance” your experience of the area. I don’t even know how to begin this. We’ve been back-country camping for decades, most of it in places where there’s no trash pick-up, recycling, or even a pit toilet. We haul everything in and we haul it all out again. And no one has ever driven up the road to shine lights on the canyon walls after the sun set, “just because”. It’s just plain weird. So we sat and made fun of whoever was driving (painfully slow) up U-128 and back down, shining a beacon on all the hot rocks above us. Sorry if you’ve been there and enjoyed the light show: we felt like it was an intrusion on our evening. But at least it was free. I don’t remember all the BLM Campgrounds dotting the landscape in 1984. There may have been one or two (we weren’t camping, so it wasn’t on my radar), but I know of a certainty that the “dude” condos and all the rafting expedition outfits were not there. The Byway was deserted. It was freaking busy in 2012. Headlights flashed by, the rumble of tires on the road, the little paved bicycle path, the full campground and the odorous pit toilet we camped by were all stark reminders that it was not 1984. In 1984, I never dreamed my kids would actually grow up and move away from me. I was the kid and I was the one who moved away from her parents. This has nothing to do with anything and yet has everything to do with this post. In 1984, I turned 28. In 2012, my daughter turned 28. Half my life ago, we drove down U-128 for the first time. Where did half my life go? 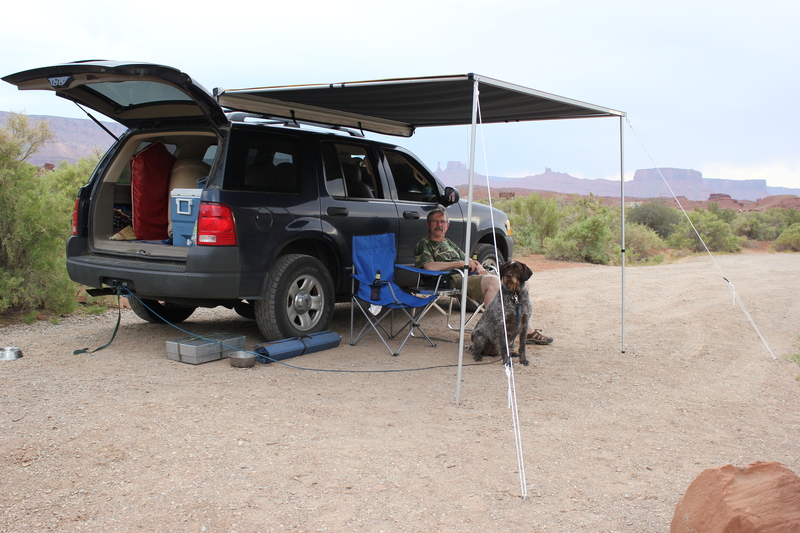 ANYway – because a post should be coherent and should have a theme, we decided to drive back down U-128 to camp in one of the more remote campgrounds on our way back through Utah. We were going back through Utah because we had to go to Reno. We were not going to stop in Ely because my parents are no longer living. In 1984, we stopped in Ely to visit my folks. My dad had just retired from the Forest Service. My mom was contemplating retiring from the BLM. In 1984, we drove across a single lane plank suspension bridge. In 2012, we crossed the Colorado River on a 2-lane concrete bridge and looked with sadness on the remnants of the historic Dewey Bridge. In 1984, we met three other rigs – at the most – and followed no one. In 2012… well, it was just busy. That canopy was Don’s Christmas present. We didn’t even walk up to this in 2012. There were too many people, it was too hot, and we had Murphy in the back of the rig. 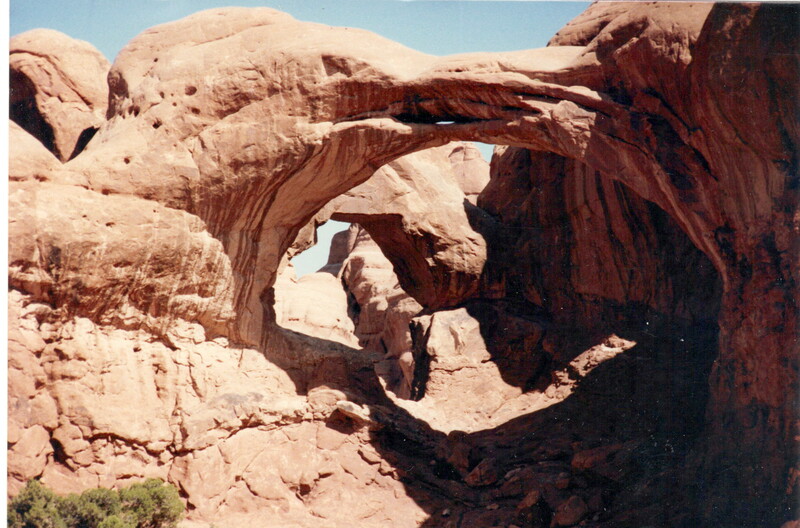 But I wanted to toss it in to show that we really have been all the way through Arches National Park at some point in time. 1984. I was almost 28. 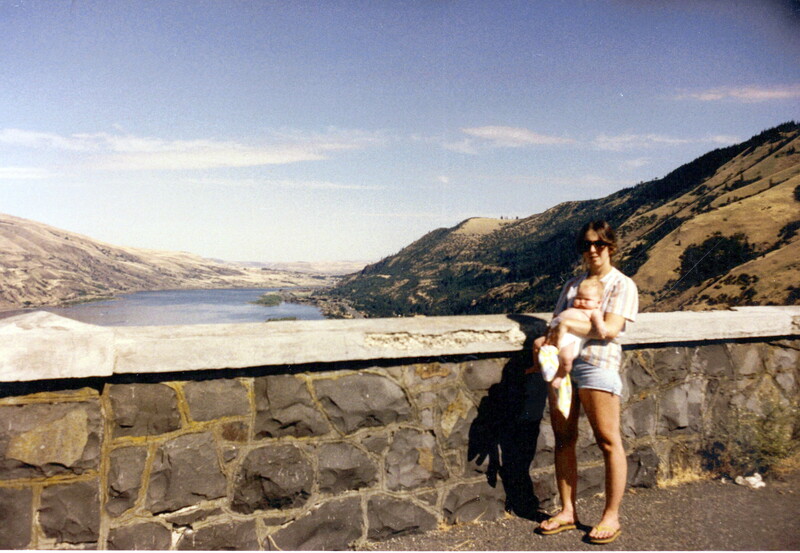 I wouldn’t even begin to attempt that pose 28 years later! Tomorrow – skipping ahead a little to celebrate my parent’s 59th Wedding Anniversary. This was such a great way to tell this story! Loved it! I wouldn’t attempt most poses I did 28 years ago, lol. You were such a beauty then (and are now! ).